Our Catering Account Managers are Superheroes. Catering Account Managers are the engine of the FoodtoEat machine. This role is a pivotal part of the company. Each day, Catering Account Mangers are creating proposals, coordinating with clients and vendors, placing and confirming orders, making sure meals go smoothly and above all, keeping clients happy! Although the day to day tasks may generally stay the same, each day is filled with different challenges that need to be handled efficiently and effectively, which makes every day different from the last. An Account Manager’s job is to make the client’s catering process simple and stress-free but, as is the nature of the food industry, mistakes happen and issues come up. In order to give you, our clients, a better understanding of the time and coordination that it takes to get from the initial “I need catering” email to your team eating delicious food from one of our local vendors, we’ve broken down the responsibilities of Catering Account Manager and explained how they do what they do. Creating proposals. When a client calls or emails with a catering request, the first step is to get all of the details and create a proposal. Generally proposals contain 3 menu options from 3 different vendors. Our Catering Account Managers create the menus and portion the meals themselves, so they have an vast knowledge of each vendor’s menu: what cuisine they offer, how many people each tray of beef or salad feeds, if the vendor charges extra for plates/napkins/utensils, etc. Using this knowledge, the Account Manager will filter through vendors that will work for the client considering the following factors: budget, headcount, dietary restrictions, delivery address and delivery date and time. Because we don’t want client’s meals to become repetitive and we want to introduce clients to new vendors and cuisines, they also look at past orders to see what cuisines the client has had in the past and try to include new and different options. These proposals are being generated for multiple clients, multiple times a day. 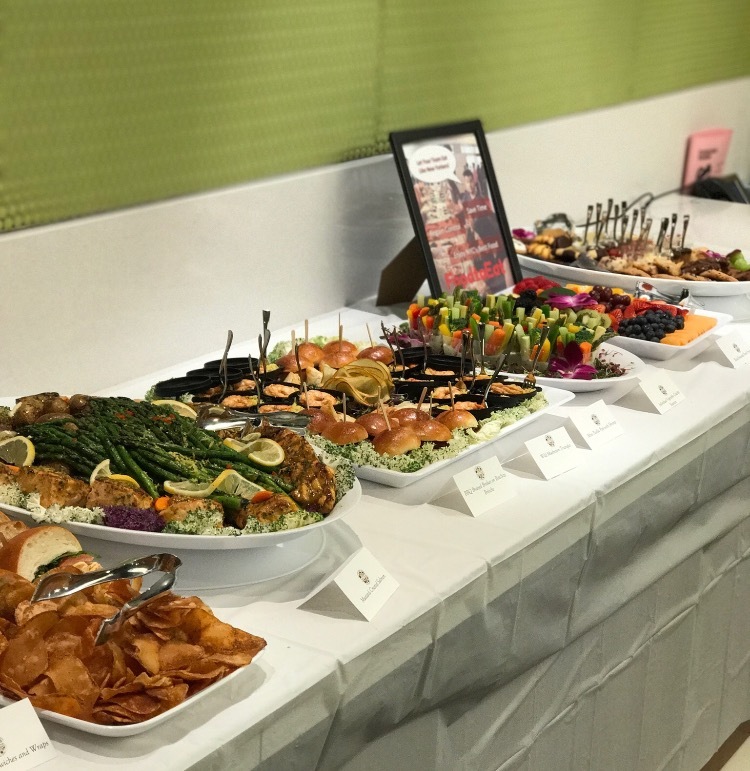 But the detail that goes into hand-crafting each and every proposal for our clients is what makes our Catering Account Managers so awesome- you truly get a customized experience based on your office’s needs. Coordinating with clients and vendors. Aside from interacting with clients, Catering Account Managers are also constantly touching base with our vendors: confirming menu pricing, seeing if vendors are available for an order, updating menus and most commonly, getting special pricing. Sometimes clients need something very specific for a meal, such as a dinosaur themed baby shower or cookies with their company’s logo printed on them. In these situations, Catering Account Manager must confer directly with the vendor and create a custom menu for the client, since these items don’t come on a standard catering menu. The Account Manager is responsible for conveying to the vendor exactly what the client wants and then must wait for the vendor to get back to them with how much it will cost. Since vendors are usually dealing with their own in-house orders or lunch/dinner rushes if they are a restaurant, it can often take a few hours or even days for the vendor to get back to them. The responsibility lies on the Catering Account Manager to make sure that they are continuously following up with the vendor for the pricing that they need as well as making sure that the custom menu is meeting the client’s expectations. Placing and confirming orders. Once a menu has been selected by the client for their meal or event, it is the Catering Account Managers job to then place the order in our system with the vendor. To place the order, they must have all relevant delivery details on file so that they can give as much detail as possible to the vendor about the order. Since the vendor isn’t coordinating directly with the client, it’s extremely important that all details on an order are as specific as possible so that there is no miscommunication on the vendor’s end. These details include delivery address (including floor or suite), delivery contact name and phone number, delivery time and event start time (so that time is given for the vendor to set up the food for the client), if the delivery needs to go through a freight elevator or if there’s a certain procedure that must be followed in regards to delivering/setting up the food. Once the order is placed, it is also the Catering Account Manager’s duty to confirm that the vendor received the order and is clear on all of the delivery details. They must also follow up with the vendor on the day of the order to be sure that everything is on track to be delivered at the requested time and that nothing is missing from the order. Last minute changes/cancellations/updates. If an order is cancelled or moved to a different day, if a delivery time is changed or the headcount on a meal is increased, the Catering Account Manager is the person taking care of it. They are responsible for communicating any changes on the order to the vendor and making sure that the vendor has an updated order form with those changes clearly noted. Now that we’ve given a breakdown of the many tasks a Catering Account Manager is taking care of each day, below are two ways that you can help your Catering Account Manager improve the service that they provide to you and other clients! Providing feedback on meals. After each meal is delivered to a client, a meal feedback form is sent out asking a few questions about what the client thought of the meal. We know that this can be time consuming when you already have a million things on your plate but we try to make the feedback form as quick and as painless as possible, while also garnering information about the vendor, the delivery and the meal itself. As a client, if you really loved or really hated something- let us know! Feedback helps the Catering Account Manager understand what your team likes and dislikes: if everyone loved the chicken, they’ll portion that a little heavier next time, or if the salmon was blah, they’ll make a note to discuss that with the vendor and see how it can be improved for another client. This feedback helps the Account Managers learn more about each client’s preferences and build a profile on the client for future proposal building. The bottom line: helping us helps you and is the best way for us to improve our service. Call or email catering requests as soon as you get them. We know that meetings come up last minute- it happens with us too! But as you get closer to your meal delivery time, the window of available vendors gets smaller. Most vendors are able to turn around an order within 24-48 hours but since we do work with a lot of local, mom & pop shops throughout NYC, many don’t have the staffing or extra food materials on hand to cook and deliver meals that aren’t scheduled a few days in advance. We are definitely able to accommodate those orders that pop up the night before or day of a meal (and we have in the past) but we’re able to give you a better range of options and create a better experience for you and your team when we have advance notice. The more lead time you can give us on an order, the better our service can work for you and the happier you’ll be with your meal! Previous Entry:Do good and make money at the same time? It’s possible and necessary. Next Entry:Show Your Appreciation on Employee Appreciation Day!